Can the United States and China avoid A Thucydides Trap? In 2003 I published an essay titled, “Why International Relations Theorists Should Stop Reading Thucydides.” I thought I made a pretty strong case. There was, first of all, the question of anachronism. No modern doctor would base his or her medical practice on the writings of Erasistratus, Herophilus, or Hippocrates, but for some reason International Relations scholars seem to think that whatever Thucydides wrote almost 2,500 years ago still applies today. There was also the question of accuracy. Thucydides told a pretty good tale, but much of it, and certainly the most famous parts, had a “take my word for it” kind of feel. The single most important bit—the claim that “[t]he growth of the power of Athens, and the alarm which this inspired in Sparta, made war inevitable” and that the Spartans went to war with Athens “not so much because they were persuaded by the arguments of the allies, as because they feared the growth of the power of the Athenians, seeing most of Hellas already subject to them”— was, in fact, supported by no evidence whatsoever and contradicted by a very great deal. Thucydides admitted as much himself when he wrote, “The real cause [of war] . . . I consider to be the one which was formally most kept out of sight”. Finally, even if Thucydides still applied, and even if what he said was accurate, there was the question of takeaway. His History is so rich that anyone with any paradigmatic predilection whatsoever could mine it for aid and comfort. If IR theorists were the proverbial blind men, Thucydides would be the proverbial elephant. The Realists got to him first and prominently staked their claim, but there is a very great deal in what he wrote, I argued, that is flatly inconsistent with the Realist take. So also do public intellectuals, it seems; for in recent years “The Thucydides Trap” has emerged as a popular image with which to make sense of U.S.-China relations. The term was first coined by Graham Allison in a widely-read 2012 op-ed in The Financial Times. He used it to refer to the combination of China’s rise and the fear this might inspire in the United States that roughly mapped onto Thucydides’ account of Athens’ rise and the fear this provoked in Sparta. The term pithily captures the core idea of A.F.K. Organski’s power transition theory, which postulates that great power wars are likeliest when a rapidly rising challenger threatens to overtake a declining hegemon . Most who write about the Thucydides Trap dismiss it, either for reasons of anachronism (“Athens did not hold $1 trillion dollars worth of Spartan treasury notes”), inaccuracy (“A glance at the history of major powers suggests that their fall originates more in self-inflicted wounds than in the challenge of rivals”), inapt metaphor (“Forget the ‘Thucydidean trap’—China and the U.S. are caught in the foreign policy version of the ‘prisoners’ dilemma’”), because China is benign (“China just wants to realize its dream of national rejuvenation, bid farewell to its humiliating modern history, and truly become a country of strong national strength, harmonious ethnic relations, and a happy and content populace”), or some combination of these. Most commentators, Allison included, insist that through sound leadership and wise policymaking, Washington and Beijing can overcome fear and mistrust and avoid conflict. Contra Mearsheimer, they maintain, China can rise peacefully . Since nothing in life is inevitable but death and taxes, a Sino-American war clearly is not. Nevertheless, when one great power sees another rise that it regards as unrelentingly hostile, it stands to reason that it will not stand idly by. It will try to protect itself and its vital interests somehow. One option is war. Key decision makers in Vienna and Berlin were willing to take their chances on the battlefield in 1914, for example, because they felt that time was not on their side . Conrad von Hötzendorf, Chief of the Austrian General Staff, felt that it was better to deal a decisive blow to Serbia before it grew stronger and Austria grew weaker, and his German counterpart Helmuth von Moltke—and even Kaiser Wilhelm II himself, at least in the early phases of the July crisis—agreed, convinced that even if an Austro-Serbian war were to escalate, Germany would never be in a better position than at the moment to fight Serbia’s patron Russia and Russia’s ally France. They may have feared future trends, but they deliberately chose war. That is the essence of The Thucydides Trap. It is hard to imagine a leader in Washington or Beijing deliberately choosing war today. Leaders in Sparta in 432 BCE and in Vienna and Berlin in 1914 had no way of foreseeing the consequences of an escalation to all-out war, but thanks to what Joseph Nye calls the nuclear “crystal ball effect,” we have a very clear idea of how cataclysmic a no-holds-barred Sino-American war would be. Even a limited conventional war would be extraordinarily costly, sending shock waves through the global economy, poisoning regional relationships, and overwhelming available mechanisms of security governance. We can safely assume that U.S. and Chinese leaders would never willingly opt for war unless they felt they had no other choice. What might cause them to think they had no other choice? Broadly speaking, there are three possibilities: they could be pushed into war; they could be pulled into war; or they could stumble into war. There aren’t many clear historical examples of leaders being pushed into war, but there are a few. Perhaps the best known are Britain’s entry into the Crimean war (1853), which was largely a function of the British public’s overwrought reaction to Russia’s attack on Turkish forces at Sinope , and the Spanish-American war (1898), prompted primarily by American outrage at Spanish atrocities in Cuba . Even Thucydides wrote of the inability of leaders to resist domestic outrage. In the famous Spartan debate, King Archidamus counseled patience, arguing that Sparta should watch, prepare, and play for time; but his prudence proved impotent in the face of Sthenelaidas’ hot-blooded call to action in the face of Athens’ insults and injuries . Ironically, leaders in Beijing, rather than Washington, would appear to be most vulnerable to this particular pathway today. I recently attended a high-level meeting of U.S. and Chinese foreign and security policy experts and was struck at how many times the Chinese participants invoked the pressures and constraints of Chinese public opinion. The American participants, ostensibly representing the democracy at the table, never once invoked U.S. public opinion. This is new, and it is frightening. Zhou Enlai and Deng Xiaoping could afford the luxury of prudent diplomatic flexibility because they enjoyed a relatively free hand, but Xi Jinping seems disturbingly captive to the intense Chinese nationalism that his predecessor Hu Jintao first mobilized a decade ago. There are several plausible “pull” pathways. A conflict between North and South Korea could embroil their Chinese and American patrons, and Washington might find itself obliged to come to the defense of one of its regional allies in the event of a local conflict in the East or South China Seas. Riffs on The Thucydides Trap could, in fact, be responsible for the pull in each case. Pyongyang might risk war with Seoul if North Korean leaders felt desperate in the face of adverse power trends. Tokyo might risk a showdown with Beijing over the Senkaku Islands if Japanese leaders became convinced that waiting was tantamount to losing. And a less pro-China government in Taipei might risk bolder concrete moves toward independence if it felt that the clock was running out on Beijing’s patience for reunification and calculated that the odds of weathering Beijing’s predictably violent response would only get worse over time. Third parties have often played an important role in catalyzing conflict throughout history. Indeed, one way of reading Thucydides is that Corinth “pulled” its Peloponnesian League ally Sparta into conflict in a similar way. Finally, the United States and China could stumble into war through misjudgment, misperception, overconfidence, or wishful thinking. Perfectly normal psychological pathologies can incline people to underestimate the risks they run and overestimate the prospects of achieving what they consider a desirable or “just” outcome. According to Thucydides, for example, Sthenalaidas felt assured of the gods’ favor because of the righteousness of Sparta’s cause . In 416 BCE the Melians chose to resist Athens against overwhelming odds for exactly the same reason . As I have argued in detail elsewhere, China and the United States could stumble into conflict by overestimating the reliability of crisis management mechanisms, underestimating each other’s resolve, and letting subjective perceptions of righteousness cloud their judgment about the likely consequences of their actions. An inability to gauge threat accurately or to anticipate the actions of others is, sadly, part of the human condition, made all the more likely and all the more dangerous by an absence of empathy. And if there is one thing we know for sure, it is that U.S. and Chinese leaders do not understand each other very well . Arguably, “The Thucydides Trap” may prove to be moot. There is nothing inevitable about China’s rise. It is entirely possible that China may sputter, fragment, or collapse. But if it does continue to rise, the main dangers lie not with “THE” Thucydides Trap—a conscious calculation on the part of American leaders that war with China sooner is preferable to a war with China later (or kowtowing to Beijing once it has risen fully)—but with one of the many other (more likely) push, pull, or stumble traps so eloquently described by Thucydides that have largely gone unnoticed.
. Robert B. Strassler and Richard Crawley, eds., The Landmark Thucydides: A Comprehensive Guide to the Peloponnesian War (New York: Free Press, 1996) 1.23, 1.88.
. Robert McCloskey, Homer Price (New York: The Viking Press, 1971), p. 58.
. A. F. K. Organski, World Politics (New York: Knopf, 1958).
. See, e.g., Graham T. Allison, Jr., “Obama and Xi Must Think Broadly to Avoid a Classic Trap,” New York Times (6 June 2013); Robert B. Zoellick, “U.S., China and Thucydides,” The National Interest (July-August 2013); Sharon Wilke, “Will the U.S. And China Collide in the 21st Century? Avoiding Thucydides’ Trap,” Belfer Center Newsletter (Spring 2015).
. See generally Richard N. Rosecrance and Steven E. Miller, eds., The Next Great War? The Roots of World War I and the Risk of U.S.-China Conflict (Cambridge, MA: MIT Press, 2014).
. David A. Welch, Justice and the Genesis of War (Cambridge: Cambridge University Press, 1993), p. 71.
. Philip S. Foner, The Spanish-Cuban-American War and the Birth of American Imperialism, 1895-1902, Vol. 1 (New York: Monthly Review Press, 1972).
. Strassler and Crawley, eds., The Landmark Thucydides: A Comprehensive Guide to the Peloponnesian War, 1.86.
. Uncertainty over Chinese motivations is the primary reason why the Obama administration has embraced a hedging strategy, and an inability to understand American uncertainty explains the erroneous Chinese conviction that the United States is practicing “containment.” See, e.g., Zhao Suisheng, “Shaping the Regional Context of China’s Rise: How the Obama Administration Brought Back Hedge in Its Engagement with China,” Journal of Contemporary China, Vol. 21, No. 75 (May 2012), pp. 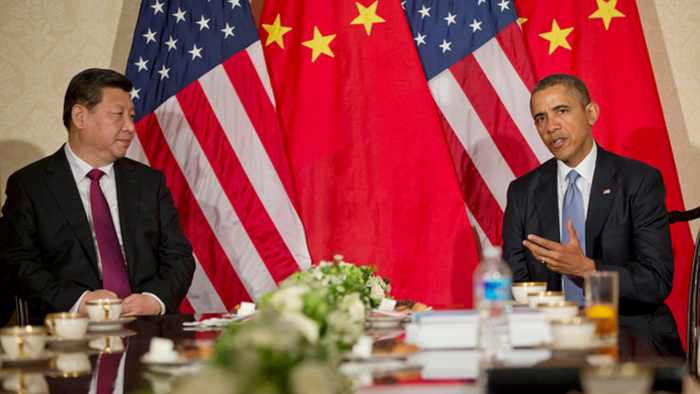 369-38; Thomas Maresca, “Obama: Goal Is Not to ‘Contain’ China,” USA Today, 28 April 2014; Zhou Jinghao, “US Containment Frays China’s Nerves,” Global Times, 25 November 2013,. David A. Welch is CIGI Chair of Global Security, Balsillie School of International Affairs. He has written extensively on foreign policy decision making and international security. His works include Painful Choices: A Theory of Foreign Policy Change, Justice and the Genesis of War, and, as co-author with Joseph Nye, Understanding Global Conflict and Cooperation: An Introduction to Theory and History (9th edition).